Last year U.S. President Barack Obama challenged America's youth and game developers to create games that teach the fundamentals of science, technology, engineering & math. Today we have a game in which aliens teach the scientific method while hunting hamburgers. Technically your grandfather is the alien that travelled to Earth in search of hamburgers and you're on a rescue mission to find him, but the end result is the same: Someone gets hamburgers, and someone learns the scientific method, the basic techniques used to discover and process new knowledge across a wide range of scientific studies. Mission Earth: The Search for Hamburgers is a game created by University of Texas at Dallas students Jainan Sankalia, Liz Paradis, Chris Camacho and Matthew Tackett. 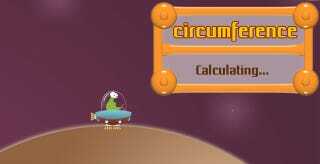 It's one of many entries in the first National STEM (science, technology, engineering & math) Video Game Challenge, aimed at bringing those fundamental skills to the children of the country in entertaining ways. Think of it as an edutainment challenge. Mission Earth: The Quest for Hamburgers is one of many entries in the STEM contest currently being voted on by folks like you. The Voter's Choice Winner receives a pass to the Game Connection to be held at the San Francisco Developers Conference in 2012, along with a room to show off their wares and free lunch for two people each day of the show. I'm not saying you shouldn't vote for Liz, Chris, Matthew, and Jainan. I just think you should check out the other entrants before voting, just in case there's a more deserving two-person team that wouldn't have to split lunch. Besides, they've already got hamburgers.